December | 2014 | The Loudest Librarian! 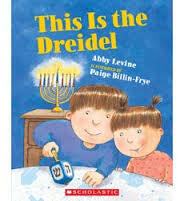 This simple rhyming story describes all the ways Max and his little sister Ruth prepare for Hanukkah: selecting the candles for the menorah, singing songs, eating latkes, etc. Esther took time to explain the pushke, a box for collecting money for charity, and asked the kids to suggest other ways they might help people in need. 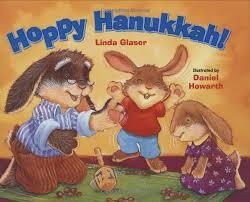 Cute story about a family of bunnies that captures the excitement of waiting until sunset to light the first candle on their menorah. Esther explained that the purpose of lighting one more candle each night, rather than lighting them all at once, is to symbolize the idea that each day can be a little brighter than the one before, or that people can always do even more to make the world a better place. I think this was the book the kids enjoyed the most. 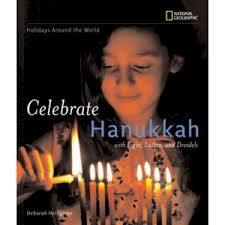 Part of the National Geographic, Holidays Around the World series, this book features photographs of people celebrating Hanukkah in different parts of the world: Uganda, Peru, Israel, etc. The text is fairly lengthy, so Esther mostly just showed the pictures and described them to the kids, who had a lot of questions and observations. 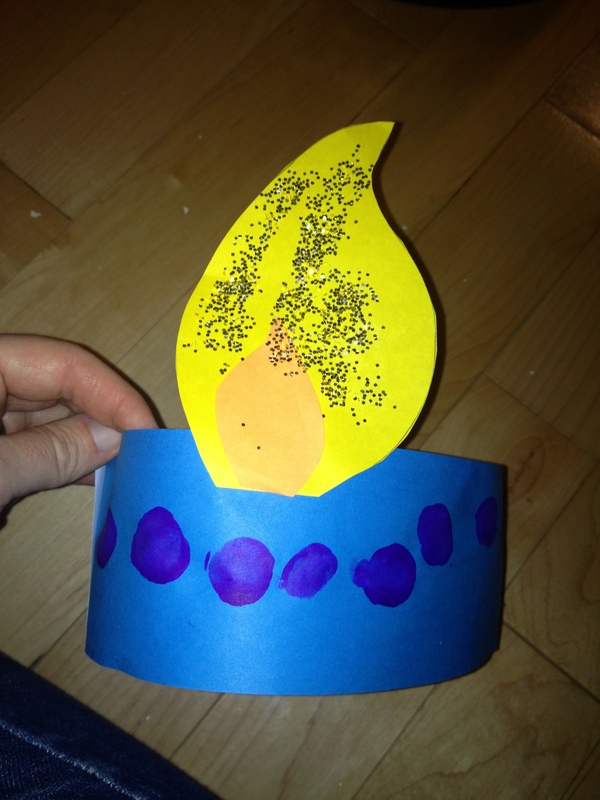 They especially liked the photo of the giant menorahs displayed in different countries, and the children wearing flame hats that made them look like candles (this was a perfect lead-in to our craft). I always end the storytime by handing out shakers and rhythm instruments, so the kids can play along to a song. This time, Esther held up this book, and I played the song on the ukulele (easy to chord with just C and G7) an easy, encouraging the kids to sing along on the chorus. Maxie Baum adds additional verses to the traditional version of the song, describing other parts of the Hanukkah tradition. Several of the kids were still singing the song while they worked on their craft at the end. Esther had suggested this craft. I based ours on this one from Pinterest. I cut out strips of blue paper for the headbands, which we helped the kids assemble with staples. 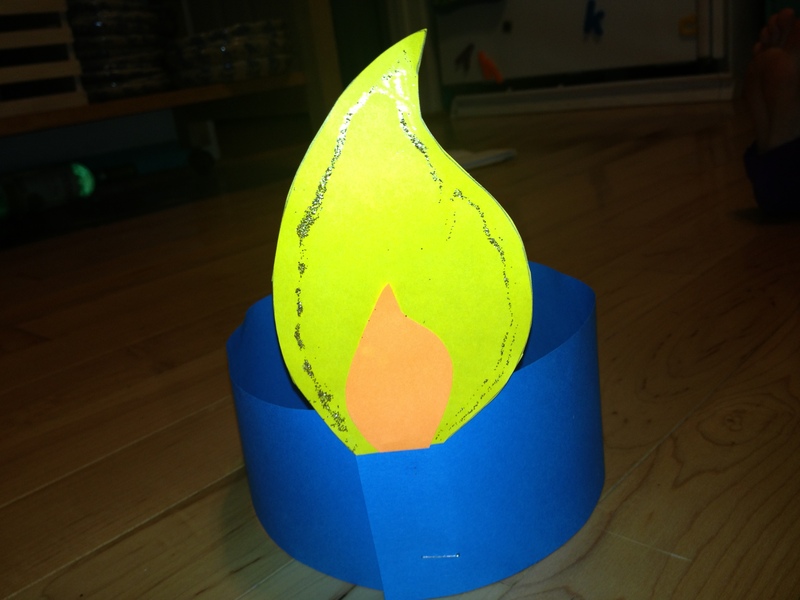 I cut the flames out of yellow paper, with a little flame in orange to go in the middle. We also gave the kids dot paint, glitter glue, and glitter to decorate. They had a great time, although of course the library was glittery afterwards. 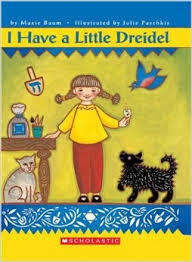 What are your favorite books about Hanukkah?